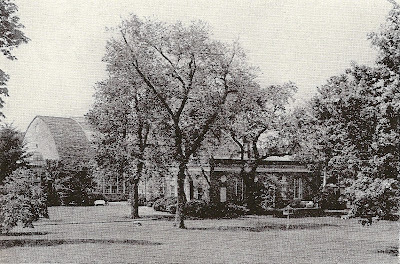 The Delano & Aldrich designed playhouse to 'Oak Point', the Harrison Williams estate enlarged by D&A c. 1926 in Bayville. Pictured is the playhouse after Harrison's wife Mona had repurposed it as their private residence. 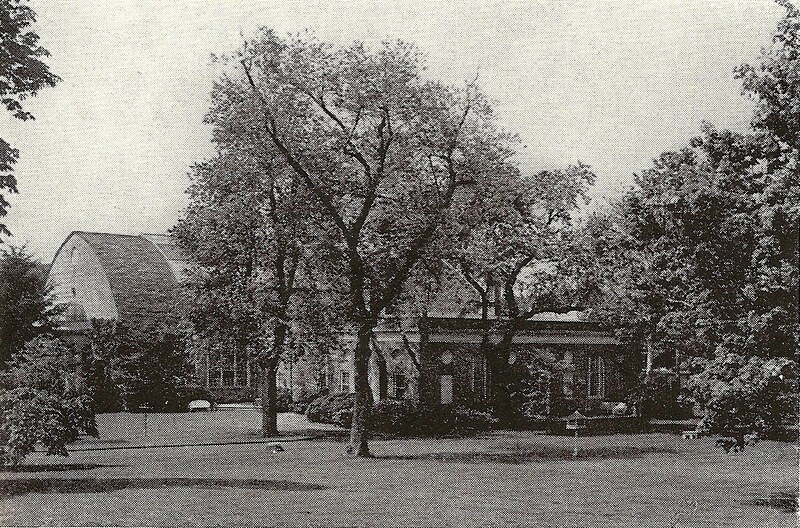 The playhouse was demolished in 1968. Click HERE for more on 'Oak Point'. Click HERE to see where the 'Oak Point' playhouse stood on google earth. 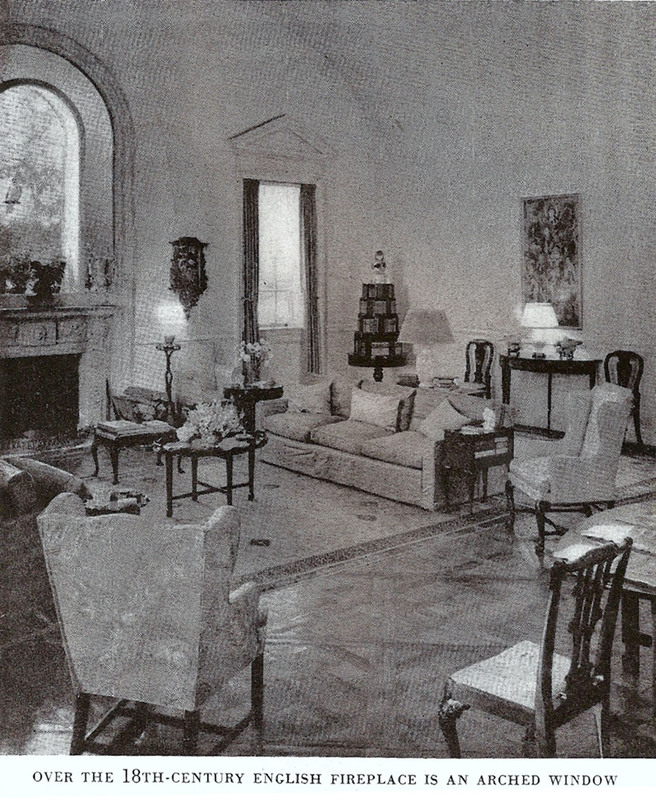 The first five photographs are from House & Garden, 1948. The final two are from Country Life, 1936 by Von Schnarendorf. Just a quick note regarding the date info at wikimapia - the Hall Monitors frown on marking locations that no longer exists. If I change anything it will prompt them to delete the whole tag and all information will be lost. HPHS, are you saying Wikimapia is anti-OLI? They must not appreciate archeology either. Beautiful interiors – having to move into one’s playhouse doesn’t seem as terrible a fate as it once did (joke). 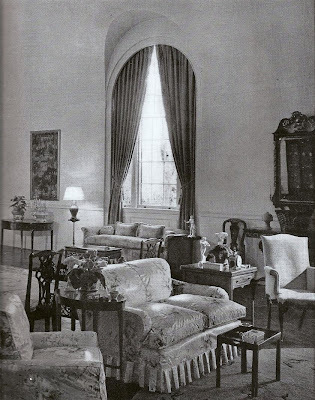 But I was puzzled about the small lamps perched atop the pedestal tables; looks odd & kind of top-heavy (to me) especially since there are floor lamps in the dining room so the Harrison Williamses weren’t adverse to floor lamps. I'm just going to add that the caption description for the 'before' pictures of the playhouse interiors is almost jaw-dropping---"Pale blue and cream set off this salt water pool; gray couches of waterproof material. 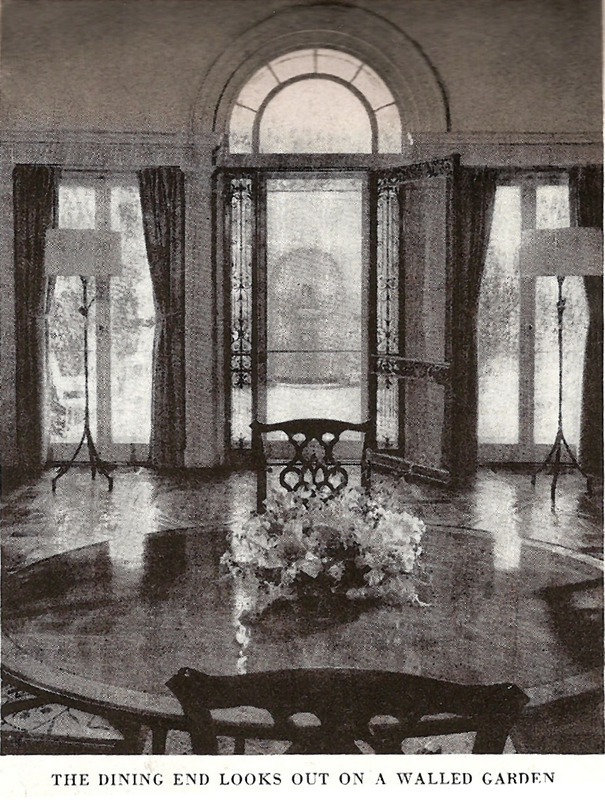 In the big room; walls of silver leaf with columns and fireplaces of stainless steel. sealskin rugs, black furniture with silver leather, and pale pink shades." 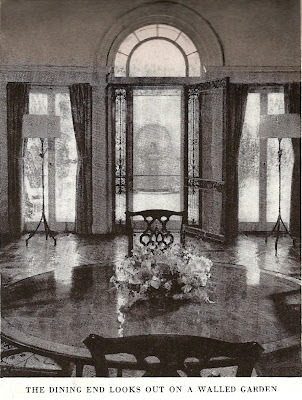 Though not mentioned in the caption, the murals are by Jose Maria Sert (known popularly as the 'Tiepolo of the Ritz'), who also did the murals for the dining room of the Straight mansion on Fifth Avenue when the William's lived there. 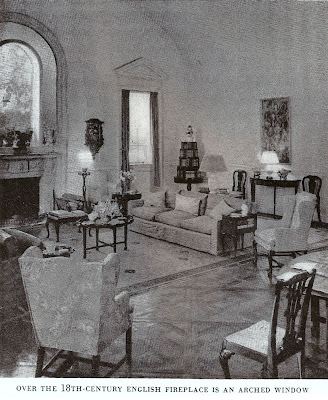 Those murals wound up in her house in Capri, I can't trace what happened to the playhouse murals. Sert also did the amazing black & gold murals at Chelsea. PS Doug---the little lampstands with Chinese lamps don't offend my eye in terms of proportion, but as a big guy lacking the grace of Fred Astaire, I do know that they look as if they'd tip over if I walked past. Very elegant place to call home. 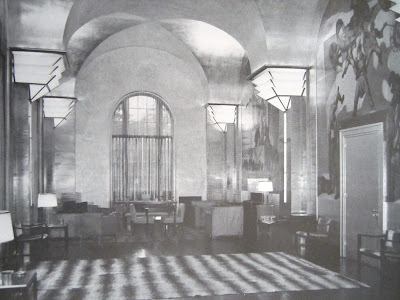 The room with the vaulted ceiling, full height murals and light sconces could easily pass for a lounge in Rockefeller Center, Radio City Music Hall or the Chrysler Building. Very impressive, cool and stylish. Very chic and elegant. The lines of the ceiling and windows in the 3rd and 4th photos would suggest this room was once indoor pool in the last photo. I'm in awe. It's a crime how the estate ended its life. Thursday and Friday posts/links were incredible. Thanks to all contributors. Keep those photos and floor plans coming. Are there any original photos of the Pratt playhouses? I guess I'm old fashioned, I prefer dark carved mahogany,or walnut or knotty-pine;wrought-iron, marble, stained glass and oriental rugs to "walls of silver leaf with columns and fireplaces of stainless steel. sealskin rugs, black furniture with silver leather, and pale pink shades." OLFI, did you happen to read the court opinion about the subdivision and zoning of the estate. From start to finish, it's a history lesson in the social and legal forces, and the sheer economics as to why many of these estates would not and could not have survived anyway. I haven't see the picture of the silver room since the 70s! Its been kicking around in my head all these years-thank you OLI for showing these pictures. When the 1st book on Jean Michel Frank came out, I was so excited to realize that all the modern furniture in Williams house was Frank... and those murals! 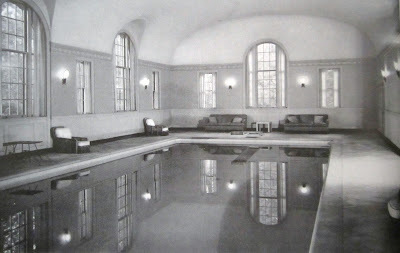 I think the pool was filled in many years after their original restoration with D&A in 1927. The furnishings around the pool seem to be of the same period and decorator (syrie Maugham?) as those of the silver room. The decoratioin of the traditional living room looks much later, done when they were older and maybe after they sold their townhouse? I guess I'm old fashioned,I prefer dark carved mahogany, or walnut or knotty-pine;wrought-iron,marble,stained glass and oriental rugs to "wall of silver leaf with columns and fireplaces of stainless steel, sealskin rugs, black furniture with silver leather, and pale pink shades"
I was in Barcelona last week where Sert's murals for Philip Sasoon's ballroom in London are on display at the Museu Nacional. Pretty amazing stuff. And DED- the Tiepolo of the Ritz- I hadn't heard that before, but how appropriate. Do I remember correctly that the Sert murals from New York were re-installed in an astonishing dining room in Mona Williams' house in Capri? I think that Aesthete's Lament had some wonderful photographs of the room, and DED's fireplace as well. Magnus, yes, you do remember correctly. For days I have thinking about where Mona Bismarck is buried...of course here on the estate with her husband...is there a memorial or tomb? The murals and fireplace surrounds from the playhouse where installed in Capri, and the porcelain parrot in the window above the living room mantle is pictured in her bedroom at Capri as well. Jean Howard had a similar if not THE parrot at her home on Benedict Canyon when intact last I saw. I do recall the dining room Sert murals were small and of a masked ball with balconies and revelers...not these of acrobats...all so Tiepolo. You can almost see Chanel and Misia gossiping while Jose Maria Sert paints by the light of the rock crystal candelabras he so collected...with Chanel being taught by his masterly eye and mind of Crystals and Coromandel. 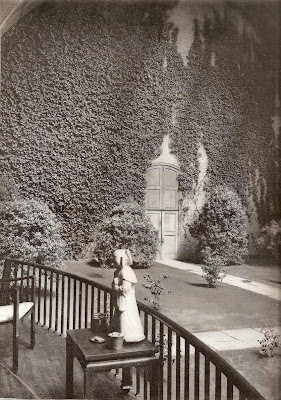 She was buried in a Givenchy gown with her third and fourth husbands, Harrison Williams and Count Eddie von Bismarck, at Glen Cove on Long Island. Of the $90 million she had inherited from Williams, approximately $25 million remained. Author lives in Bolivia, have yet to find source for this book. Half Pudding, exactly where is she buried? I, too would be interested to know precisely where she was burried. I can't think of a cemetery in Glen Cove that would have been "swish" enough for her. My vote is the Locust Valley Cemetery which houses (is that the right word?) quite a number of fancy folk from all over the Island. Does anyone know for sure? I also wonder if she inherited anything like $90 million. I have seen that number bandied about and published in a number of places, but as a skeptic of long standing, these estimates of the net worth of highly publicized people (like the room count of their houses), tends to be wildly exagerated. I don't know why, but reading about Harrison Williams and all his stuff puts me in mind of that great Bugs Bunny episode where Elmer Fudd, suffering from some delusion or other, repeatedly introduces himself as "Elmer Fudd, millionaire. I have a mansion and a yacht". Sorry. It's early in the morning and I'm suffering from jet lag. I believe they are interred in the Locust Valley cemetery. I share Magnus's skepticism. The probate value of an estate is a matter of public record, so an intrepid researcher could gather that information. If one spends any time at all in the New York Times archives, one discovers that as recently as the 20's, the Times found a will that disposed of just half a million impressive enough to report. I don't think I could ever get my fill of Mona! Confirmed - interned at Locust Valley Cemetery. Is the best-dressed woman in town. Has a Rolls-Royce built for each gown. That Mrs. Simpson dined behind the throne? I’ve got a cute king of my own. One needs to find the photographs from the 87 Vanity Fair article, in which all was gossamer. I did not read the court papers. this is how it all went down. First the initial developer agreed to leave the western half the estate undeveloped in exchange for being allowed to pack the houses along the bluff in like sardines. Next, they stripped away as much topsoil as they could and sold it. Then, people paid them to dump"clean fill where the topsoil had been. Shortly after they got all the sardine cans built, they declared bankruptcy. The "new" developer came in and petitioned to build out the "protected parts" of the estate. They were given permission, albeit at a somewhat dense configuration. The result is what you see today (sad, given how far it fell). To borrow a (para)phrase from the Clinton camp, "It's the ZONING, stupid" is the answer to the oft asked "How could they?" question on this blog. Back in the '20, areas were carved out (as incorporated villages) to protect against the onslaught. They also fought electrification of the Oyster Bay line for the same reason. To an extent, it worked, but when profit is at stake, all bets are off. I beg to differ with the development post entirely. If you look at the Oak Point subdivision that was built on the eastern half of the estate, there are protected areas preserved behind the houses and the eastern edge of the property where the original gatehouses stood is also preserved. When the next developer came in on the western half, the density was greatly increased and only a small internal area was preserved, almost in the exact spot where the playhouse stood. Had they stuck with the original development scheme, there would be more preserved areas today. Of course, nobody in their right mind would leave the bluff empty of houses. If you want to cast blame, look internally at the villages themselves where nobody wants preservation laws enforced. Mill Neck has repeatedly shot down preservation efforts as have many North Shore villages, including Old Westbury. Residents of East Island refused to allow a condo conversion of the JP Morgan estate preferring instead the horribly crappy houses that were built in its place. Towns view preservation as infringing upon their property owners rights. Sadly they prefer demolition to anything like cluster zoning or god forbid increased density to preserve estate land. Dont blame a developer for doing what the towns gladly let him get a way with. (This pertains to the pending development of Wawapek Farm, the Robert and Emily de Forest estate in Cold Spring Harbor. The main house, which is still in more or less original condition, was one of Atterbury's earliest and best efforts, and led directly to a number of his subsequent commissions. I meant this last bit for you. Thanks for the links Ancient...I was not aware of this ongoing issue. I only skimmed the Town of Huntington .pdf but it sounds like no changes will be made to the house...which is at least the best possible outcome in a subdivision (unless I read it wrong). I always felt like Huntington was a little better prepared to fight these preservation related issues...guess not this time. I think that's right with regard to the two principal houses themselves. Reading the above link from The Ancient I was able to finally id the "remains of a formal hedge/garden". It always seemed removed from any existing structure. I had wondered if another home was connected to it. Was Olmsted involved? Yes, Olmstead was in charge of the grounds.